Chris Stem is a graduate of Delaware Valley University, located in Doylseton, PA, and obtained a bachelors degree in Large Animal Science. After completing his bachelors degree he took a position with the Hanover County Sheriff’s Office in Hanover County, Virginia where he currently is a investigator in the General Investigations Division. 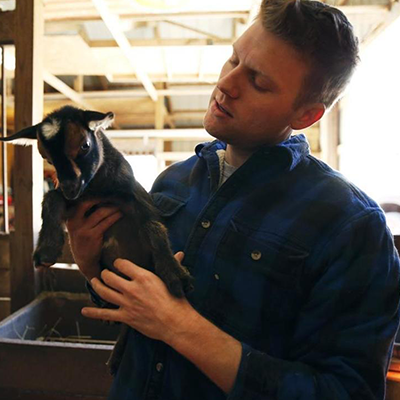 Chris founded Harlow Ridge Farm in 2015 where he raises Tamworth/Berkshire Hogs, Black Angus and a variety breed of sheep. Harlow Ridge Farm quickly expanded and currently provides pork products to numerous local groceries, farm markets and restaurants in the Richmond area. In March of 2018 Chris Stem and Bruce Johnson founded Ashland Meat Co. which was a re-brand of Cross Bros. Grocery in Ashland, VA. Ashland Meat Co. offers local sourced meat, produce and provisions to the region. Ashland Meat Co. has a full time butcher shop and an on-site butcher. Ashland Meat Co. provides affordable, fresh and accessible products to the Richmond community.